Home » Beige Tights » Figure Skating Boots » Figure Skating Costumes » Grand Prix of Figure Skating » Ice Style » Michelle Kwan » Rachael Flatt » White Skates vs Beige Skates » ICE STYLE.....Figure Skating Costume Question: White vs. Beige Skates? The Great (Figure Skating) Debate: White, Beige or Skin Tone Tights Over The Boots? Just in time for the final Grand Prix of Figure Skating Competition, which is occurring as I type in Beijing China, I began an email discussion with one of my Figure Skating "gals", the beautiful Courtney Prince, who skated professionally for a while but now owns the Jewelry Design company, Doloris Petunia. She emailed me asking "White Skates or Beige Skates?" 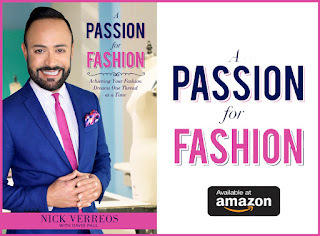 She wanted my Fashion Designer (and Figure Skating fan) opinion. Her argument was that wearing beige skates made the skater look, well, a bit less professional. So naturally, I said "I need to post a BLOG about this" and see what other people think. And I also decided to take it another step further and add: "Well, what about beige tights over the skating boots?". Why would Figure Skaters decide one versus the other. Is wearing beige skates more of a statement of "I'm not traditional"? And finally, covering the entire leg--and boot--in skin-tone tights, would that be more to elongate the figure, especially for some skaters who well, might not be so height-inclined? White Skates seem to be the de-rigueur and more traditional choice for Ladies Figure Skaters throughout the years. This changed in the late 80's when more and more professional figure skaters began to buck the "White Skate" rule and go for the beige ones. And then toward the late 90's, and early 2000's, we began to see the all-over skin-tone/beige tights over the skates look as well. In 1968 , Peggy Fleming won the Olympic Gold, wearing White Skates. She looked elegant and very "Mad Men" Figure Skater!! Dorothy Hamill became the 1976 Olympic Champion...in White Skates. I see a pattern here: If you go to the Olympics, and want to win the Gold, ,maybe White Skates is your secret "boot" ticket. On Hamill, they were the perfect accessory since her costume had white-ish sequin trim on the neckline and sleeve of her red costume. Looking at these two icons of Figure Skating and thinking about costumes in 2010/2011, wearing White Boots might seem a bit "Retro", n'est pas? 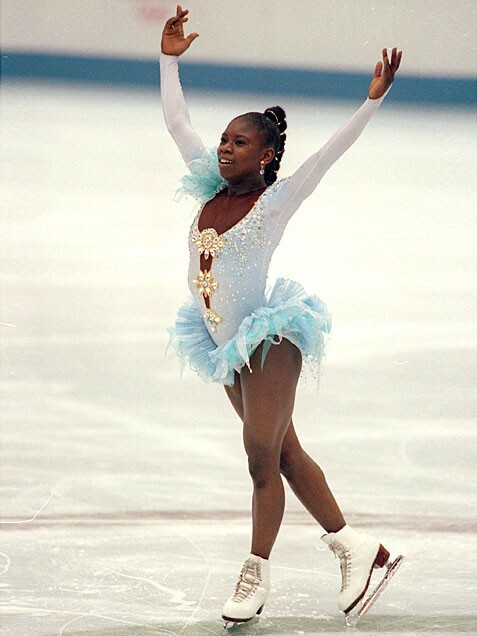 In the 1992 Albertville Olympics, France's Surya Bonaly, caused a major ESCANDALO, when she refused to wear tights(!). My Figure Skating "Research Assistant" tells me that Danskin only makes tights in "never seen the sun" ballerina cream or "toast"(tan-a-rama! ), so I can see why Bonaly just never wore tights when she competed (she just couldn't find a pair to match her skin tone). She still opted for the traditional White Skates--to go with her non-traditional glitzy over-the-top costumes. Two years later, at the 1994 Winter Olympics, there was Miss Tonya Harding and her infamous broken boot lace incident. Yep, she wore White Skates and they coordinated well with her costume. 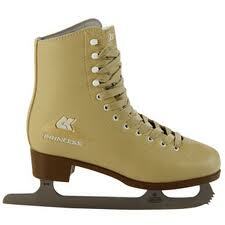 They were the "Stars" of this Olympic boot lace incident, as well as the fact that her skates had GOLD blades. This was considered a bit on the tacky side and trust me kiddies, it was a topic of discussion amongst many a figure skating competition-watching party! In the early 2000's, we began to see the beige-tights-over-skates trend more. Exhibit A: Sarah Hughes, 2002 Olympic Gold Medalist. Hughes wore the beige tights over the skates look with her sequined lilac costume. Exhibit B: In 2006 Winter Olympics in Torino (of which I actually went to! 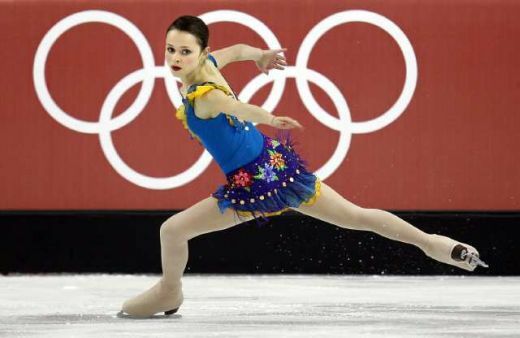 ), Sasha Cohen skated in skin-tone tights over her boots, as well. Sasha, of course is known for her LONG lines and UNBELIEVABLE leg extensions. 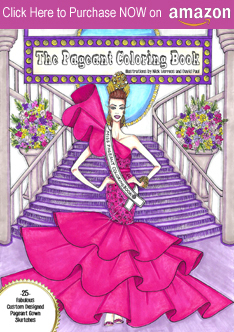 So in her case, it does make sense to cover the entire leg in skin-tone, in order to exaggerate even more the length of her lines. So what is the trend now, in 2010/2011? The stunning Barbie Doll-like Kiira Korpi from Finland, opts for the White Skates. Korpi looks like a figure skater from the 1960's, and from head to toe, she exudes a Retro vibe. So it makes perfect sense for her to go for the White Skates as opposed to the all-beige-leg look. And finally, there's Rachael Flatt, from the USA, who chooses beige tights over the skates, as opposed to the White Skates. So, it seems that the great debate over "Which one is better?" or "Which is more Professional Looking?" will continue. I think, it all depends on the skater, the costume, and also the height of the skater. 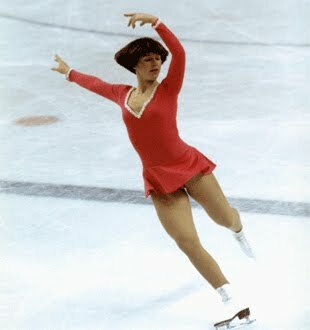 Shorter competitors should probably opt for the beige tight/skate look, while if you want to be more on the "Peggy Fleming/Dorothy Hamill" end--and be more "traditional"--then go for the White Skates. Although for me there is one deal breaker and that is the Olympics. I am siding with a White Skate only policy. To me it is almost like not wearing a White Tennis Outfit to Wimbledon! For the Gran-daddy of all Sports and for photos that will appear for an eternity, classic white is always the answer! What do you think? 12 Responses to "ICE STYLE.....Figure Skating Costume Question: White vs. Beige Skates?" Easy answer. . . White skates -- all the way. None of this beige skate or tights-over-skates look. Follow the lead of the always-elegant Michelle Kwan, and wear white skates! Never understood the tights over skates look. Are you trying to fool people into thinking you're not wearing boots? That the blades just sprouted out of your feet? I love the beige tights over the boot...but I hate beige skates. IMO, either wear white skates or beige tights. :) But that's just me! Hate the tights over boots look. I agree with those who said it should be white skates all the way. One trend I can recall that you didn't mention: Canadian singles competitor Lisa Sargent (older sister of coach and former paira champion Kristi Wirtz), when she was competing, wore footless tights. They pulled down over the tops of her skates, but didn't cover all of them. Not sure how widespread this trend was. Good for those who liked bare feet with their skates, I guess. I always wore tights with mine, though. I think Jamie Sale was commenting on this question on Twitter -- I think she said they HAVE to wear white skates for Stars on Ice. Skaters will tell you that the reason they like the tights over the skate look is that you don't have to keep your skates in pristine shape! No skate tape, no boot covers, no polishing and shining before a competition! Just pop on those over-the-boot tights, and you are always good to go! But it's ugly, and I always have preferred the traditional look of those beautiful white skates! I commented on Facebook but wanted to add that the Capezio at one time made a whole line of tights for Dance Theater of Harlem that came in many hues. They became available to the public shortly after. For an African American skater it makes more sense to use those tights over the skates, unless you can get skates in that color, which I doubt. I am still a fan of using the same color skates as legs. Is Oksana bare legged as well in that photo? Imagine falling? Ouch!!!! a) tights over the boot make the skater look like they have a weird second pair of knees down there and yea- why give the illusion of blades coming out of your soles? But they are practical- elite skater's skates look horrible up close- beaten up, taped up... All as a result of the many-many hundreds of hours of practice. And it's not like they can buy a new pair for every event. b) the beige boot hardly looks beige on the ice. The colour is kind of brownish/greenish, like something you'd expect to come out of you after some bad curry. Ick. c) but! There are worse things out there- like the legging/beige tights version, where the boot is covered up to the ankle. It should prolong the leg, I suppose it does- but it messes with proportion of the actual boot making it look more like a tennis shoe or a slipper or something. Ahh, and the absolute worst thing I've seen- beiege fishnet tights over the boot- Elene Gedi. wore those last season. Left me quite speechless. P.S. Cavalli's contract with Caro ended after the Oly season- her dresses are now made by Iceberg, thought you'd like to know ;). I for one,used to despise those over-the-boot tights with a burning passion. Until one night,I was watching a YouTube video segment of Dancing On Ice UK-the 2008 season. The skater who is not actually a skater,which is a celebrity that caught my attention was none other than Suzanne Shaw. It happened during the Props week episode when I witnessed Suzanne suffering an ankle injury,and I realized that the over-the-boot tights were just a mere pair of leggings. All this time I was mistaking the over-the-boot tights for pantyhose because of the look and the color. It was all just mind games to me. As a skater,women would usually wear white socks underneath the skates as they would slip the tights over the skate boot. One thing you must know is that the tights have clips,eye hooks,or Velcro at the bottom. White skates with beige tights, definitely!!! Actually, if I was a judge in figure skating, I would deduct points to those with beige skates or tights over the boots. I don’t skate, just to get that out of the way. But I’ve always thought the tights over boot looked weird, and rather than give a long line, just calls attention to the top of the boot. So, why don’t women wear flared stretch pants over boots secured with a strap under the skates? It looks great on the guys. If you’re going with he BEIGE/beige option for a longer line, seems like the tights should be inside the boots, or else the tights should be more like a pant - straight line from the bottom of the calf to the boot.